A national group of engineers that advises cities on street safety designs — and has long discouraged certain bike-safety efforts — looks like it finally agrees that protected bike lanes are, in fact, a good thing. A draft edition of the American Association of State Highway and Transportation Officials’ Bike Guide, an engineering manual used by transportation planners nationwide, includes for the first time a host of security measures such as protected bike lanes, protected intersections, sidewalk level bike lanes and parking protected bike lanes — designs that some cities have successfully implemented for years. The draft, created by the Toole Design Group, was circulated at the Walk Bike Places conference this week in New Orleans. It still needs review by various AASHTO committees, which are helmed by officials from state departments of transportation, but it at least finally includes all of the best designs. The final version is due out next year. AASHTO’s failure to include cutting-edge street treatments has given cities an excuse to not implement them — especially in cities with fewer resources or more conservative traffic engineers. Bollard-protected bike lanes, bike lanes separated from traffic by concrete curbs, potted plants, or jersey barriers: the guide has them all. 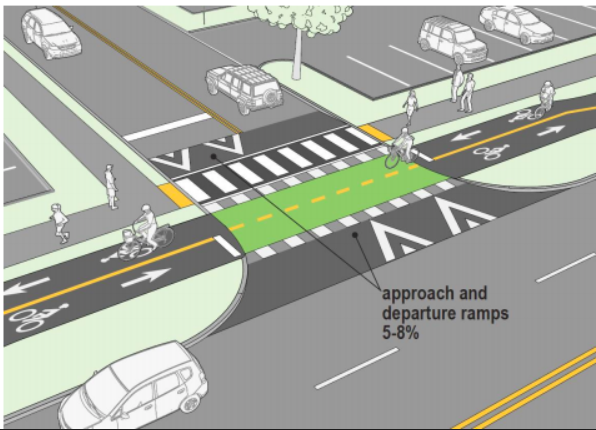 In addition, it has guidance for parking-protected bike lanes, contra-flow bike lanes and sidewalk-level (Dutch style) protected bike lanes. Basically all the designs that leading Vision Zero cities use are in the draft. Mountains of data shows these facilities increase bicycling rates tremendously and are safer than roads that offer no protection. Right now, protected intersections only exist in a handful of U.S. cities — but they’re gaining popularity, doubling every eight months, Michael Andersen at People for Bikes reported. If they remain in the final AASHTO guide, such designs would proliferate much more quickly. 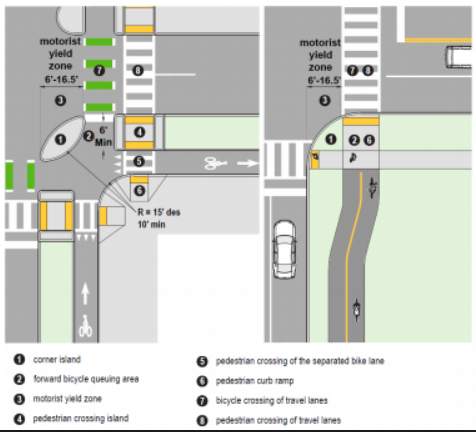 It would be a major development because conflict between cyclists and drivers at intersections remains a key argument trotted out by anti-bike lane groups to keep bike facilities out of previous AASHTO guides. Rather than use potential conflicts as an excuse to ignore cyclists, this treatment attempts to resolve the issue with design. Driveways — spots where drivers pass through the sidewalk area — has been another sticking point with some engineers on protected bike lanes. But the draft guide recommends continuing the green lane through the driveway and marking the outside with crosswalk-like symbols — a smart strategy for alerting drivers to the potential conflicts. One big qualification, however, is that protected bike lanes and these other treatments are still not approved by the perhaps more important engineering manual: the Manual on Uniform Traffic Control Devices. Approval by AASHTO would provide transportation engineers greater support for building top-notch bike infrastructure, but the AASHTO guide still states that planners should seek special permission from the Federal Highway Administration before installing treatments that the agency’s Manual on Uniform Traffic Control Devices considers “experimental,” such as protected bike lanes and intersections. Hopefully, the manual will be the next important engineering group to enter the 21st century with respect to bike facilities.